I recall reading that head-hold gyros aren’t compatible with the RN-1? I forget the details. Also the voltage rating may be a concern. I’ve found my RN battery is typically above 6.7v after it’s charged. Not sure how that would factor. The PG03 is priced very well at www.gwsparts.com if you decide to go that route. I’m looking forward to installing mine. I Finally got around to installing my PG03 gyros. No small feat for this newb! Everything I needed was in this thread. Thanks to all for the great info. 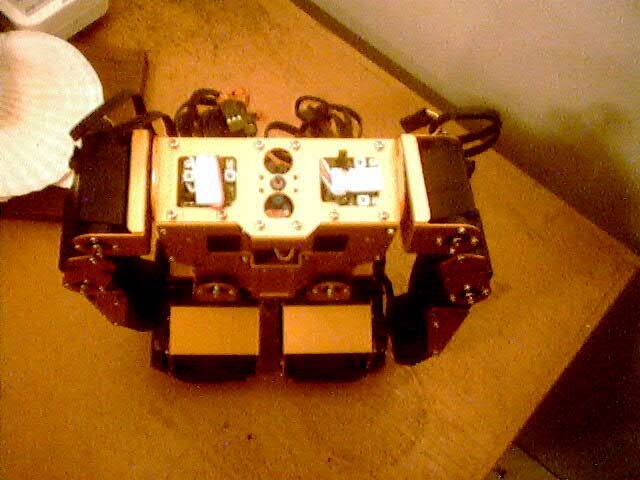 After some experimenting, I split the gyro covers apart and installed only the board on the shoulder servos. It does require Dremelling the rectangular holes in the shoulder plate a few mm to make them fit. So far they're working great. Once again, thanks to all the RN-1 pioneers! SWEET! I'm going to try mounting mine like this. Did you run into any tricky stuff? H3dude wrote: SWEET! I'm going to try mounting mine like this. Did you run into any tricky stuff? Only had a very minor problem with mounting the forward/rear gyro. There is not enough space for a connector on the gyro output. I carefully bent the 3 output pins into a U-shape so they point in the opposite direction. Soldered the wires directly to the pins and covered with shrink tube. Not only does it allow it to fit within the shoulder space, it made it easy to route the output wires through the rear or the RN. By far the greatest grunt work was enlarging the rectangular holes. BTW your article - “project: how to add gyros to your robonova” was of great help. Thanks Zembot. And thanks again to all the folks on this forum who helped me figure it all out. thats sweet, it looks really clean, iam going to follow in your footsteps. thanks for the pic and info. And H3dude thank you also for your "project: how to add gyros to your robonova"
It is well documented and has guided me though excellently. Quick question about the servo reaction to the gyro. When i push RN1 from the front he reacts quite well - with servos resisting the force. However, when i puch from the back there is little or no counter servo responce. Secondly - is there a way to increase the reaction - so he thows his arms forward or backward to prevent a face plant? I was buying my RN-1 together with two Futuba G190 Gyro, taped one on the shoulders and hooked it up to the controller. I guess everything is connected the way it's supposed to be (I also read the postings in this forum). I must say that the G190 seems not to be compliant to the RN-1 firmware. The robot only shakes and whatever settings I tried (direction + sensitivity), it's not stabalizing at all. 'and the ankle slot is set to zero for backward movement. Yes, zero's matter here. 'Gyrosense tells leg sets their sensitivity, 0 - 255. 'tell arm sets their sensitivity, 0 - 255. Can anybody tell me, if I need to put my G190's on ebay or is there a trick to get them working with RN-1? Is there a manual gain setting on the gyro itself? If that is set to max it could give you this effect. You could always test by just applying the gyro to one servo, bring gain way down and seeing if it works on that one servo, try rotating 90 degrees and such. I honestly do not know anything about the Futaba G190, so I cant give anything more then suggestions. It just seems to me that the GYROSENSE being 10 and 15 is very low (mine is in the range of 100-200) and that works really well for me. So my guess would be a manual setting on the gyro. I know that when I have mine set to the max it does the same. Hi hivemind, thanks for your reply. Actually I tried various gain settings vs. GYROSENSE values. So far, the gain setting has absolutely no effect on the shaking. Just for fun I removed the Gyro from the robot and mount it flat on my table, without being physically connected to the robot at all (except the cables of course ). Result...Same shaking. When the gyro was mounted on the robot, swinging the robot didn't have an effect to the Servo movements either... I'am running out of ideas. As I mentioned before, I have two G190 and exchanged them, to exclude that the one I was using might be damaged, but nada, no cure for the issue. I just installed 2 gws pg-03 gyros and I'm quite pleased with the added stability. It took some trial and error to get the gain set just right but eventually I found the sweet spot where I could still notice the gyro effect and not get the shakes. The Gyros are now installed on top of the shoulder servos like Zembot has shown in his picture. It's a tight fit, but I managed to get some foam tape under the gyros to help reduce vibrations. Best of all the gyros are functional and hidden like the other little mods I've done.....Very nice! Heres a picture of the work. I drilled 2 holes in the plastic case to access the set up screws. I've never had to adjust the gain after the initial setup, so there is no access to the gain screws except for opening up the robot's back. Thanks to everyone who has helped by sharing their experiences. Re: Gyro in Robonova-1 ? Sorry if I put in evidence this thread but I would like some advice. I am about to buy a gyro for my ROBONOVA after the HGR01 burned. In addition to classic GWS PG03 and HGR01, are commercially available gyroscopes compatible but slightly more "up to date"?